This analog groove synth is so small you can take it anywhere. It can operate for up to 14 hours off it's batteries. This lets you create grooves with eight-step pattern sequencing, allowing you to create and manipulate groove sequences in real time. You can create custom synth sounds, kicks, snares and hi-hats. Very powerful sound in a small package. The price is right at around $250.00. 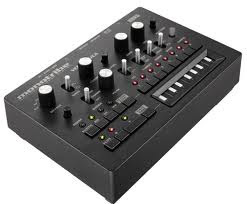 For more info visit Korg here.